Features Beta Glucan, which helps to activate immune system function to guard against infection. 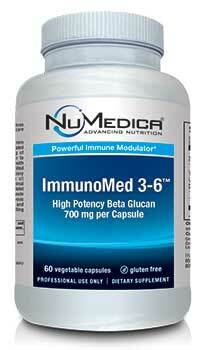 NuMedica ImmunoMed 3-6 features Beta Glucan, which medical research has shown to have a powerful effect on the immune system by boosting its ability to fight infection and eliminate oxidative stresses or other stresses to the body that may occur as a result of radiation therapy. This scientifically researched ingredient is popular among people who require immune system support. Beta Glucan literally has the power to activate the immune system and function at a high level of efficiency. Many infectious viruses can decrease our immune system's power to function optimally. Viruses like influenza reduce immune system function and lead to illness. Beta Glucan, on the other hand, helps the immune system guard against its suppressed function to it can more effectively fight infectious threats and other foreign elements that could decrease health. Researchers have been especially excited about Beta Glucan's potential to reduce health risks associated with heart disease and cancer. Clinical studies suggest that Beta Glucan may help the immune cells fight off cancer with regulated responses because of improved immune system support. Beta Glucan may also have the ability to reduce bad cholesterol in the blood and decrease the risk of heart disease. 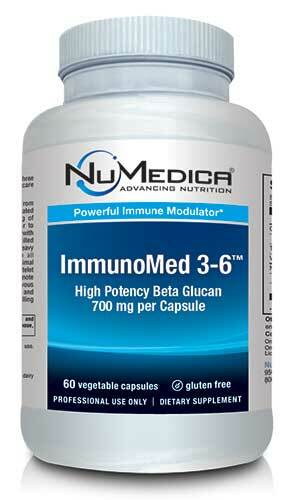 Talk to your healthcare provider about the benefits of Beta Glucan and then try NuMedica ImmunoMed 3-6 for immune system support. This supplement may guard against serious diseases but it can also reduce your risk for contracting infections, which is always a good idea, but especially so if you have recently received treatments that may have reduced immune system function. Your doctor can discuss if this supplement is the right course of action for you. By boosting your immune system function, your body will be better equipped to fight common infections. Directions: Take one capsule one or two times daily, first thing in the morning or last thing at night, (before or well after a meal) with a full glass of water or as directed by your healthcare practitioner. Caution: Do not take if you have known or suspected yeast allergies. Keep out of reach of children.